Sophistication and architectural integrity radiate from this exceptionally well executed renovation of one of West Hollywood’s only 1920’s Vintage Courtyard Condominiums. Situated in one of the very best locations in the building, this stylish unit offers east, south and western exposures with new large French windows looking out through lush foliage and down to an inviting tropical courtyard. This 2 Bedroom, 2 Bath, Plus Office unit offers a perfect floor-plan, high ceilings, ideal circulation and thoughtful modern touches appropriate for a building of this stature. Delight in luxurious new baths, smartly arranged kitchen, and well proportioned living room. 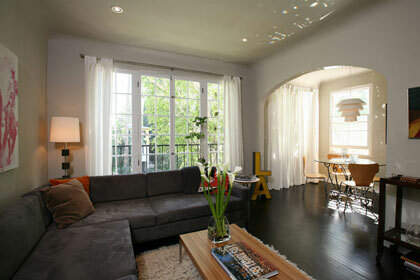 Enjoy special features such as wood-burning fireplace, rich wood floors, custom recessed lighting and upgraded systems. Address practicality with extra storage, 3 parking spaces and all utilities paid in low H.O.A. fees.